More than 2,500 people have been executed by the Iranian regime since Rouhani took office in 2013. Tuesday’s rally also included a choreographed mock execution of approximately 30,000 political prisoners whom the Iranian regime hung or shot in 1988. At least 50 Iranian officials who are actively serving in Rouhani’s administration were directly involved in overseeing those mass executions. That quote was a motto suggested for use on the Seal of the United States. Although it was not ultimately used for that purpose, Jefferson took it for use as his personal seal. Scholars believe Franklin wrote it. 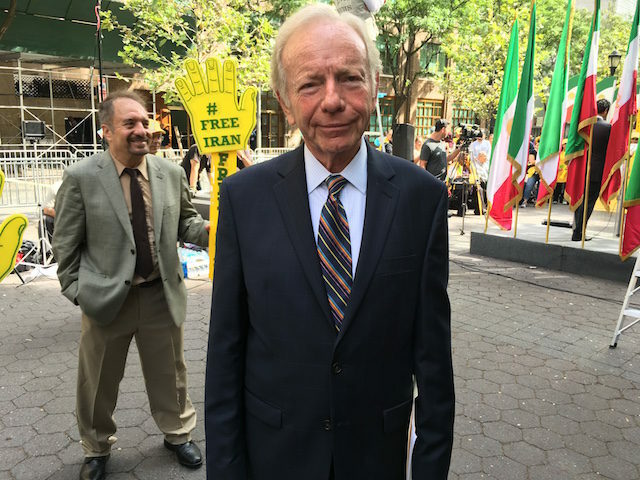 Lieberman added that everyone gathered at the rally was there to “celebrate freedom,” including the relocation of the remaining MEK members from Camp Liberty (Hurriya) in Iraq to Albania earlier this month. The camp, which has been a place of refuge for dissidents against the Iranian regime since the 1980s, was officially closed with the exit of the Iranian resistance movement’s remaining 280 members from Iraq.